One of my greatest passions as a designer is designing custom furniture pieces. Being an Interior Designer, it is really hard for me to put myself in a box and say I design kitchen and baths or I design residential or commercial interiors. I just design! As a matter of fact there is nothing that I would not want to design. I love a challenge. Many times when I am interviewed I am asked what is your signature style? If I had a signature style I would not be much of a designer to any of my clients because it would be all about me and not about bringing there visions to reality. I believe a good designer will listen to their client and make there dreams of that space evolve.I would like to share a few of my custom furniture designs with you and I hope you enjoy them as much as I did designing them. The loft bed is a design that I did for an eleven year old boy. 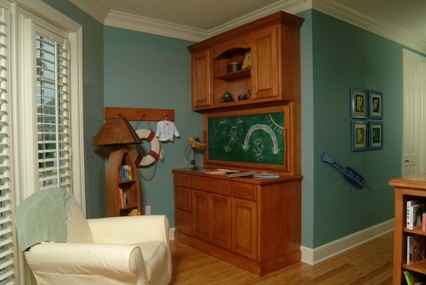 The challenge with this space was a 10 x 10 ft. room that needed to function well for an active boy. The room had vaulted ceilings so I used the height of the room and went up. This loft design allows me to use all of the floor space in the room without any wasted area. The queen size bed gives growing room for the young man and created a nice homework area below with a desk so he can do his studies. The open shelves make great bookshelf and display area for athletic trophies and awards. I designed dresser drawers at the end of the bed and open shelves above for stereo equipment. 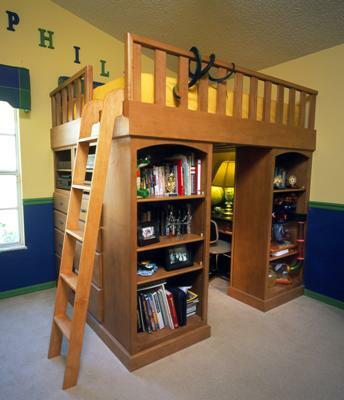 The loft bed design won me numerous national awards and is still one of my fav’s. Doesn’t the day bed look inviting for lounging while reading a great novel? This is a condominium on the Atlantic Ocean with a dynamite view. I designed an integral bed into this niche that not only serves a purpose, but looks beautiful as well. I would call this coastal living. This is a desk I designed for my oldest son who is wheelchair bound. 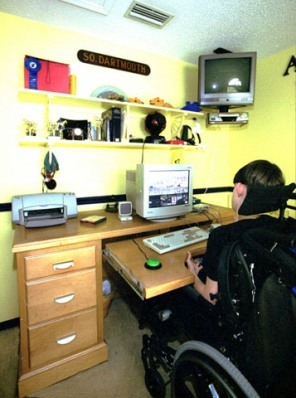 The keyboard pulls out and the cutout allows Patrick to be able to pull his chair up comfortably to access his computer. 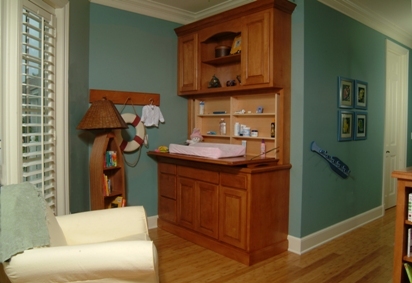 The family needed an entertainment center with open shelves for family pictures. They also wanted a space to put the computer, but did not want it exposed all the time. I designed a roll top desk to hide the computer. 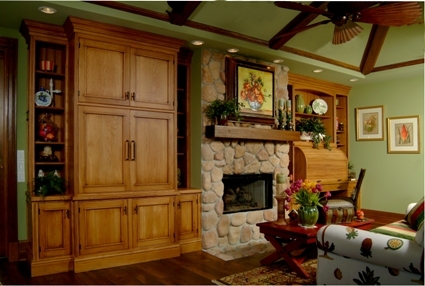 The custom furniture answered all their needs in their cozy room. 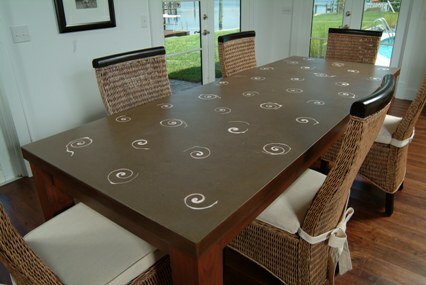 The concrete dining table was designed with embedded laser cut conch shells. This is part of my coastal living collection. A soft contemporary piece introducing eco friendly bamboo was just the touch this dining room needed to meet the informal needs of the family. It was part of the open room concept which included the kitchen and dining room that opened up onto the pool/patio for fun entertaining. Bamboo and tigris inlay panel make up this tropical dining table. 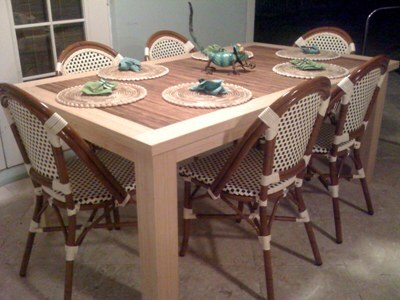 Bamboo can be used outside under a lanai and is moisture resistant. The two armoires function well in this master bedroom for storage and also create a perfect excuse for a window seat in between that looks out on an ocean view. I removed the closet to create a large bathroom for a person in a wheelchair. 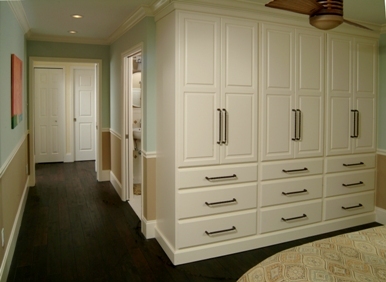 The built-ins I designed into the bedroom gave organized storage for the disabled person. Closed this appears to be a dresser in a young persons room. Opened it makes into a baby changer that would grow with the child for many uses. Designing furniture is loads of fun. 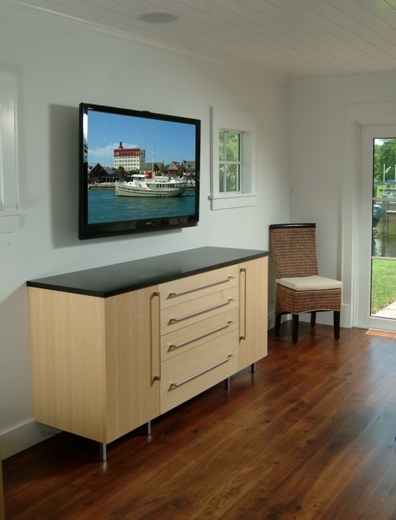 I recommend considering a custom designed piece that fits your specific needs the next time you are thinking about buying a new piece of furniture.